Though known for its EMI financing, Bajaj Finance Limited faced an uphill task of establishing its presence in the home loans and personal loans market. The toughest challenge faced was from established banks capitalizing on online traffic because of their direct connect with customers via their pan-India retail banking operations. Add to that Online Aggregators, who were outranking Bajaj Finance on many of their brand keywords. The challenge also included poor SERP rankings, and ineffective URL tagging system which distorted traffic numbers in Google Analytics. A decision was taken at Techmagnate to adopt a 360° approach to SEO optimization comprising Onsite SEO, Content Optimization and Marketing along with Link Building. The idea was to deliver results across the Search Landscape – Product Keywords, Local SEO for city keywords and Map results, Brand keywords, Direct Answer Box on both Desktop and Mobile. We ran one campaign each for the two targeted loan products - Personal loan and Home loan. Two dedicated Teams of 5 SEO experts each were set up to tackle this very challenging enterprise SEO campaign. The first step though was a comprehensive keyword research and bucketing to identify content requirements to bolster the website. Our teams identified about 2000 keywords each for the two products and initiated their effective use. This was followed by onsite performance improvement, navigational changes, blogs optimization, link building and content marketing. Simultaneously, Local Search Optimization for city-based keywords was performed to improve search visibility across India. We also put in efforts to reclaim top rankings for the entire set of Brand Keywords. Next, we tweaked content to start appearing in Direct Answer Box, driving up the traffic to the site. Tasks for enhancement of user engagement and conversion rate optimization were also initiated. We reiterated our belief that targets are just a number and phenomenal results are achievable with concentrated efforts across the Google Search landscape. A mammoth scaling of numbers (in triple figures) was witnessed in the one year period from February ’16 to January ’17. Ranking for “Personal Loan” was pushed up from 12th to 5th and 3rd position on Desktop and Mobile respectively. Set targets were dwarfed as results achieved by Techmagnate grew exponentially. 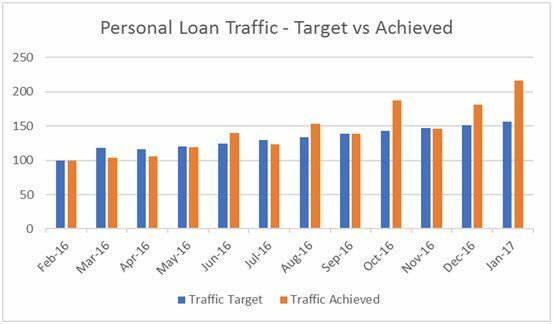 We achieved our target for traffic from the Personal Loan campaign in the first month followed by a marginal decrease. But, as the chart depicts, August ‘16 onwards targets were either met or overachieved. 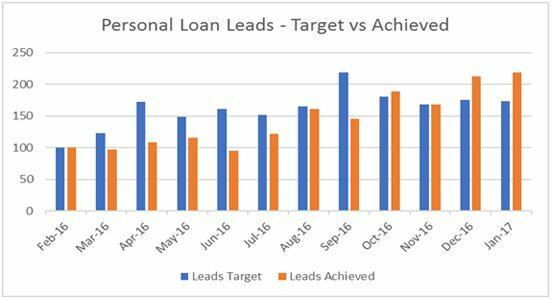 We surpassed all expectations in the month of January ‘17, way ahead of October, the month considered the peak season for the loan industry. NOTE: The absolute numbers have been indexed, with Feb. ‘16 set equal to 100, in order to facilitate the comparison of growth over the next 11 months. Increase in traffic positively affected the leads generated. 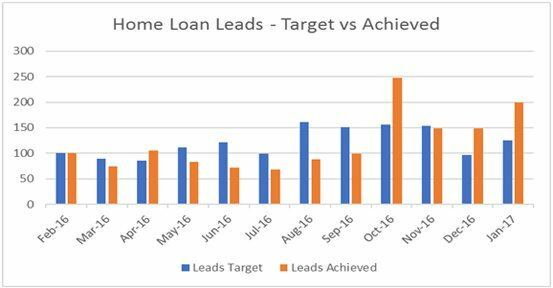 Again, in the initial months, targets seemed high, but starting October onwards targets for leads were either met or overachieved. The chart below depicts a consistent overachievement of targets, by large margins, over the last two months, December ‘16 to January ’17. Ranking for “Home Loan” was pushed up from 31stto 5th and 4thposition on Desktop and Mobile respectively. 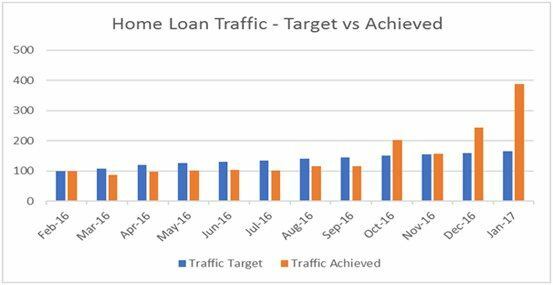 An astounding growth in traffic by 187% pushed Bajaj Finance to revise its targets for the coming months. From being in the graveyard of the Google SERPs to appearing on the first page, the journey has been tough and the learnings high. October ‘16 onwards the targets were either met or overachieved. In the month of January, we almost tripled the traffic in comparison to the target. An astounding achievement by any and all means. A slow start to the number of leads generated for Bajaj Finance was not a deterrent. By the time October rolled around, we began to surpass targets, and we continued with this streak for the remaining year. A phenomenal success story was created with diligent efforts over a period of one year. We overachieved our targets by an astounding margin allowing the client to dream bigger. However, as a part of our learning, we once again established that a phenomenal success story is not possible without collaborative effort. Results were not achieved in a day, but through patience on the part of Bajaj Finance and persistence on ours. We knew what we were doing, and despite the slow start, we remained steadfast on SEO strategy formulated at the beginning. The results are there for all to see. We are very sure that without our client’s unstinting faith, their quick turnaround on tasks along with our in-depth research and targeted applications both Bajaj Finance and Techmagnate could not have enjoyed this phenomenal success. Our learning: never despair but work confidently and consistently and shared success is guaranteed.